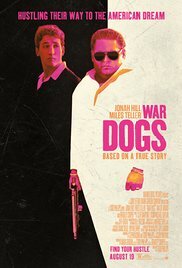 War Dogs; a movie about two twenty-somethings who get rich off selling weapons. To one, it is all about money and the one who started his own business is founder Efraim Diverolli (Jonah Hill), he returns home and meets up with an old friend from junior high named David Packouz (Miles Teller). Married to Iz (Ana de Armas) -- a new actress I haven't seen before and quite beautiful -- David also has a child on the way. He's done massaging and selling bed covers for a living and asks Efraim for a job. Little does he know what he's getting himself into. The government has weapons deals anyone can bid on but Efraim has got it to a science and only searches for the deals those upper companies don't care about because they are low end -- the term War Dogs come from the fact that they feed on these scrap contracts. Each deal the pair completes gets them noticed by bigger jobs and moves them higher up the totem pole. Eventually, they get a huge contract from the government they cannot pass up and that's when the story gets really interesting. Things go from super great to super crappy. War Dogs turn out to be something unexpected and I was really entertained. It had action, comedy, and a really good storyline. Jonah Hill played his part really well -- you realize how sketchy Efraim can be and all Miles Teller's character David can do is go with the flow. The other character who really got my attention is Iz, other than being gorgeous she was a good romantic flame for David. Bradley Cooper makes a couple cameos but nothing major. Definitely go see this flick, it's entertaining and fun!